According to Informatica, an average email list decays at least 30% each year. Not all of your disengaged or dormant email subscribers are lost causes. In fact, there are still plenty of ways to win them back. You already won them over once before so re-engaging them shouldn’t be too challenging. Here are nine win-back emails to help you do that. Often, your inner creativity needs a little inspiration to get started crafting the emails. Below are nine of my favorite re-engagement emails, each with a unique approach to re-engaging subscribers. Who doesn’t like freebies? Especially on your birthday? I know I do. And Old Navy knows it, too. 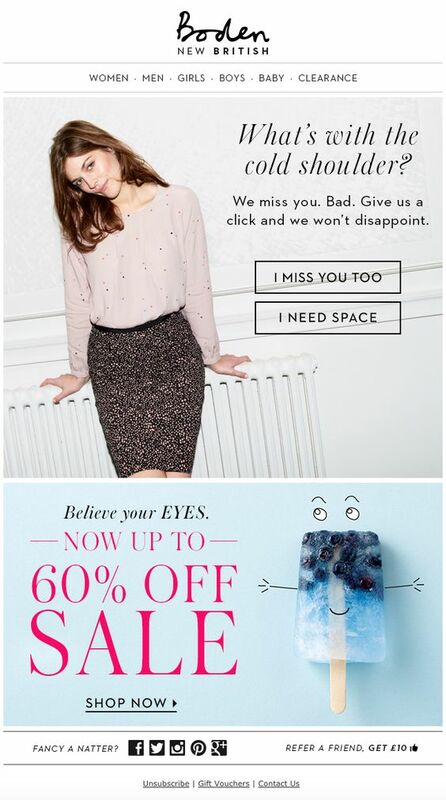 Old Navy uses a clever approach by speaking to the reader like an old friend would. 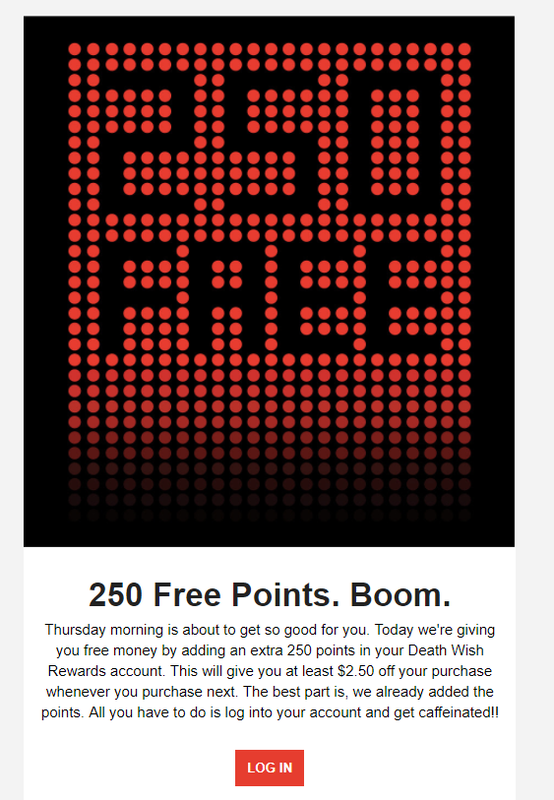 The goal of this email is to get gather relevant data about the subscriber, and a freebie is a great bait to nudge the reader into updating their preferences and information. Knowing your target audience is key to effective email marketing and Urban Outfitters is a company that knows who their target audience is and how to communicate with them. By sending a re-engagement email that looks like a text message, the format relates to the demographic they are targeting and it immediately captivates their attention. It’s a fun and humorous approach which encourages the readers to continue reading because it fits with their way of communication. Boden also plays on the relationship they have with their readers. 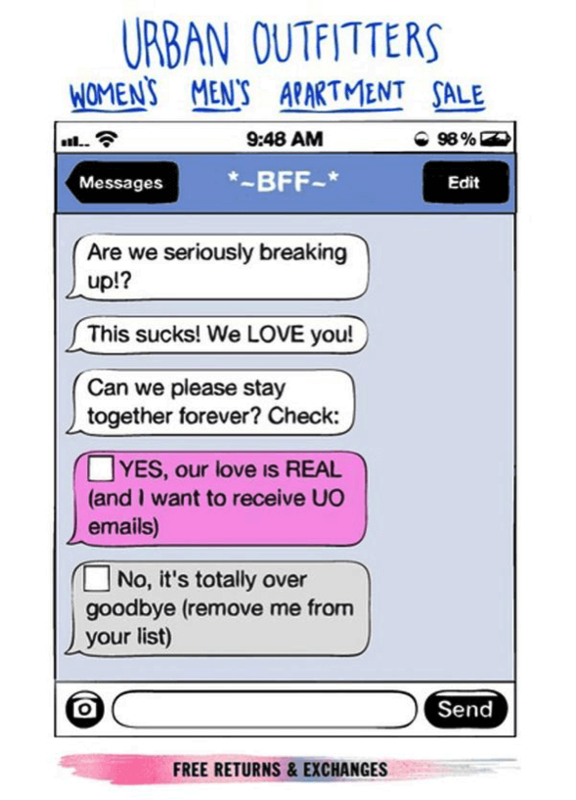 They combine the heartache of a break-up with something pragmatic like the sale promotion. It’s a simple and well-crafted email. First, they pique your interest and then they gently guide you towards their sales. And since they already have your attention you’re more likely to think ‘Hey, why not check out the discounts’. Furthermore, personalized subject lines are 50% more likely to get emails opened so you should consider ways to include personalization to ensure your emails get opened in the first place. Discounts, free shipping or other incentives are proven ways to encourage your subscribers to return to your site and check out your products or services again. It piques their interest and invites them to browse your site. 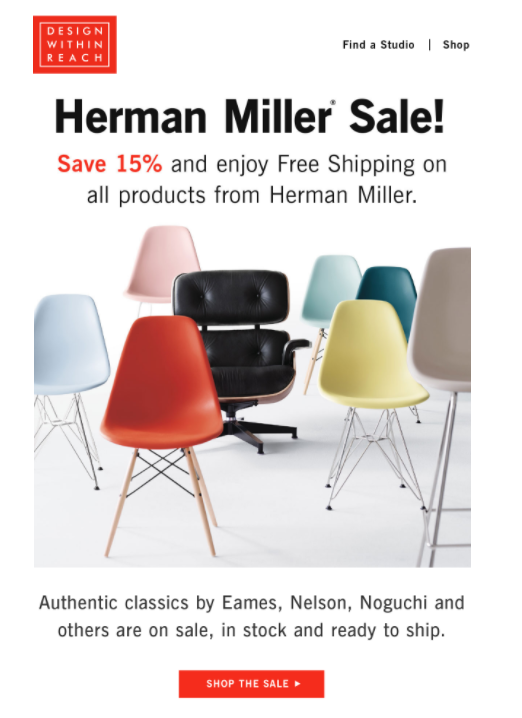 Design Without Reach are combining two things customers really love: a sale and getting something for free. Another re-engagement approach could be to introduce your subscribers to something new. 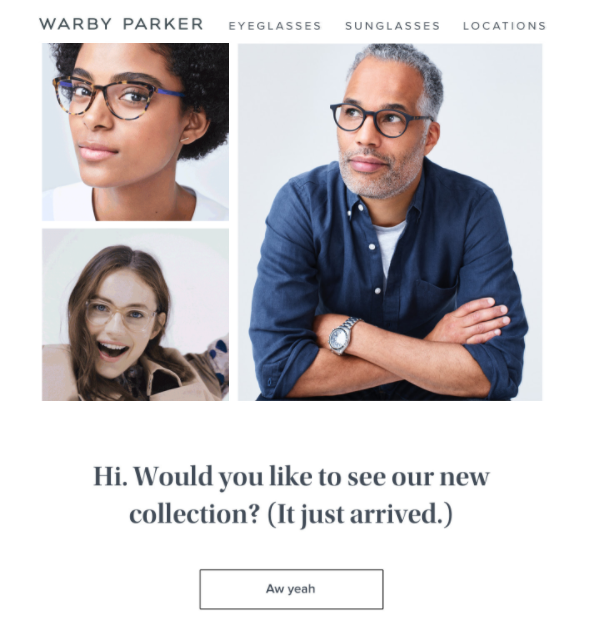 Warby Parker sends out this email to inform people of their new collection. Warby Parker plays with curiosity and exclusivity. By using a phrase like “It just arrived” it means that not many people have seen the new collection and can potentially be one of the first to own a pair. If collecting points and bonuses is part of your business strategy, adding more points to your customer’s account can be a great re-engagement strategy. This approach is used by Death Wish Coffee who puts the extra points into your account so you can save money on your next purchase. Point or other loyalty programmes is a clever way to not only re-engage dormant subscriber but it’s also good for turning them into repeat customers. When using points or other loyalty programmes to encourage your customers, you need to communicate clearly what the benefit for the customers are in the long run so they’ll want to opt-in for your offer. And remember, 20% of your customers contribute to 80% of your revenue and it’s nearly seven times as expensive to gain a new customer than it is to maintain a relationship with an existing customer. So remember to nurture your existing customer relationships. Have you ever signed up for a free trial because you thought the tool was interesting and relevant to you? And have you then been so busy that you either forgot or didn’t have time to try it out? And chances are that the people at HelpScout have been in the same situation as well. 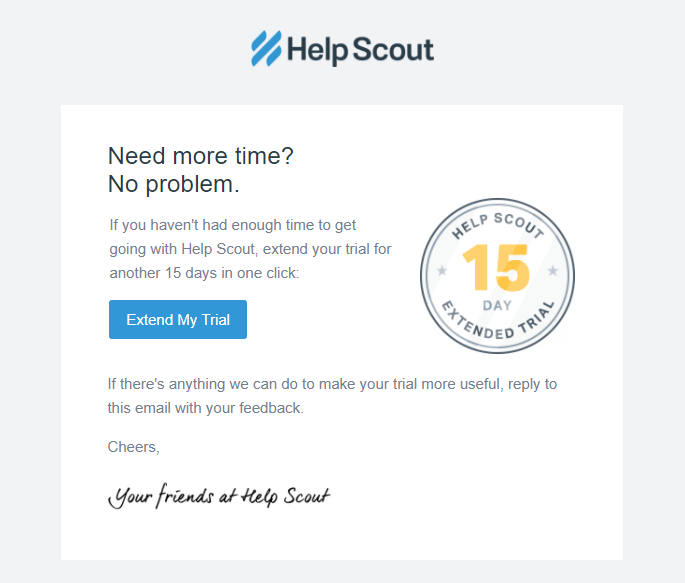 HelpScout knows that many people end up in this situation and to win-back some of their customers they offer an extended free trial period. Being able to relate to the issues and obstacles which your target audience are facing will enable you to offer the right incentive and win back some of your dormant subscribers. A picture says more than a thousand words. Show it, don’t tell it. You get my point. Sometimes you don’t have to use a lot of fancy words to convey your message. Ticketfly uses this animated GIF to show their readers that they miss them. It doesn’t necessarily need to be an animated GIF but a simple stock image will do the trick if it’s paired with a clever message. It just can’t be emphasized enough that you need to research your audience, learn about their needs and preferences, what they like, and how they talk. Personalization is key when trying to engage your email subscribers. If you’re just guessing, all your personalization efforts will be a complete waste of time. 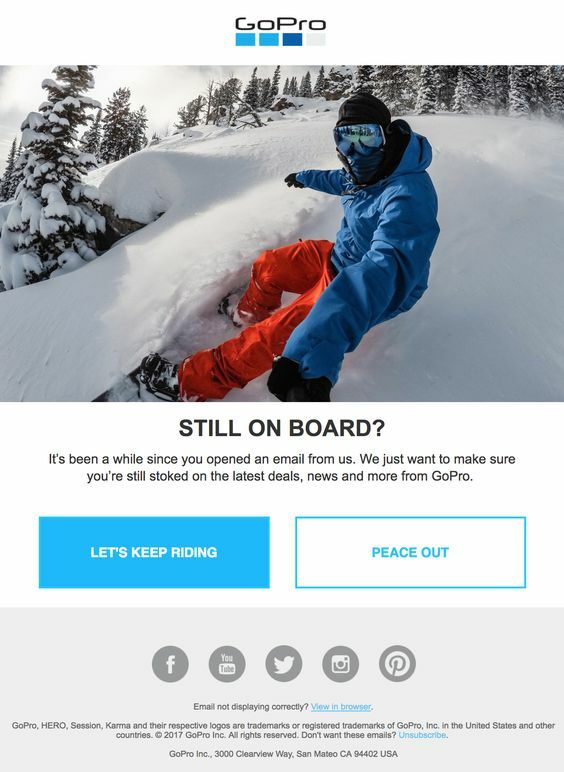 This example from GoPro is a brilliant one. They know that many of their users are active and adventurous so they are using the same jargon and way to communicate with their target audience. Email lists decay by 25% each year. But luckily, there’s something we can do about it. Do some research and get to know your audience and try to figure out why they opted in in the first place. When you know your audience, you can better relate to the problems and the obstacles they’re facing. You know their needs and preferences, and how they communicate. Translate all these findings into your emails and go win back those subscribers. In truth, a quarter of your email list still opt-out annually. But hey, not all unsubscribes are a bad thing. In fact, if they stay as disengaged subscribers they could hurt your overall email engagement rates. Well, we just saw 9 great re-engagement examples of how to win back those dormant subscribers. 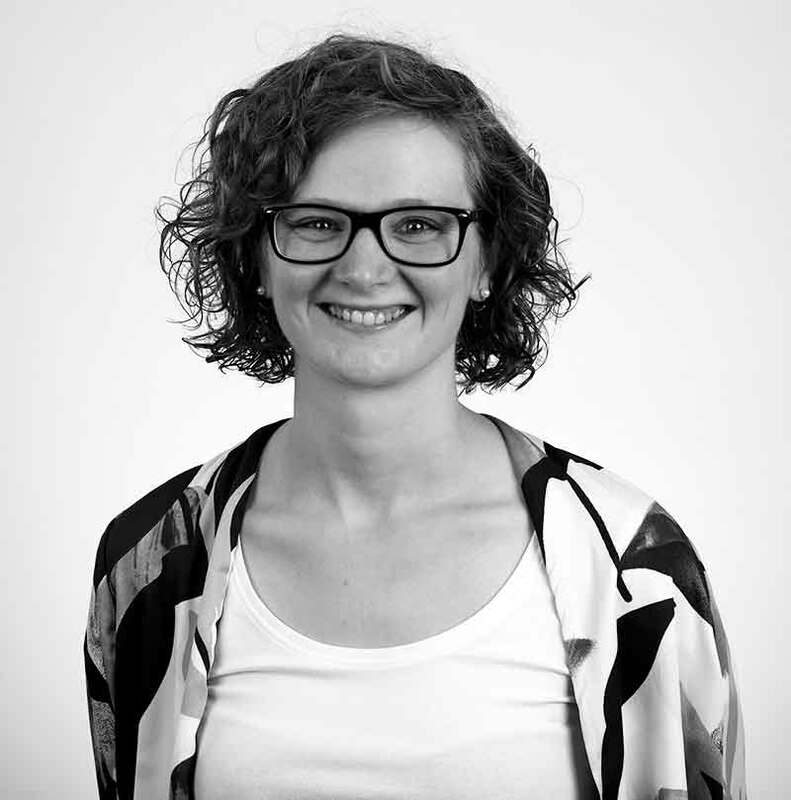 About author: Maria Hougaard Sørensen is a content marketer at Sleeknote: a company that helps e-commerce businesses capture and convert more leads without hurting the user experience. Find her on LinkedIn or Twitter!